We host a Mass on the 2nd Sunday of each month at 7:30am. We are currently served by Rev. Mark Jones and have merged with St. Matthew Church of the Village of Campbellsport. Our St. Martin Field Mass will be held on June 5th, 2016 at 10:30am. If you would like any more information about St. Martin Chapel or wish to join St. Matthew Parish community, please contact Stephanie at 920-533-4441. 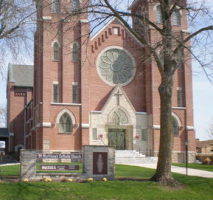 St. Matthew Parish offices are located at 419 Mill Street in Campbellsport, Wisconsin.